Legend tells of an ageless Shepherd that once learned to tame dragons and keep them in his fields. Otherwise brutal beasts could be found peacefully grazing and enjoying each other's company under this entity's watchful gaze. 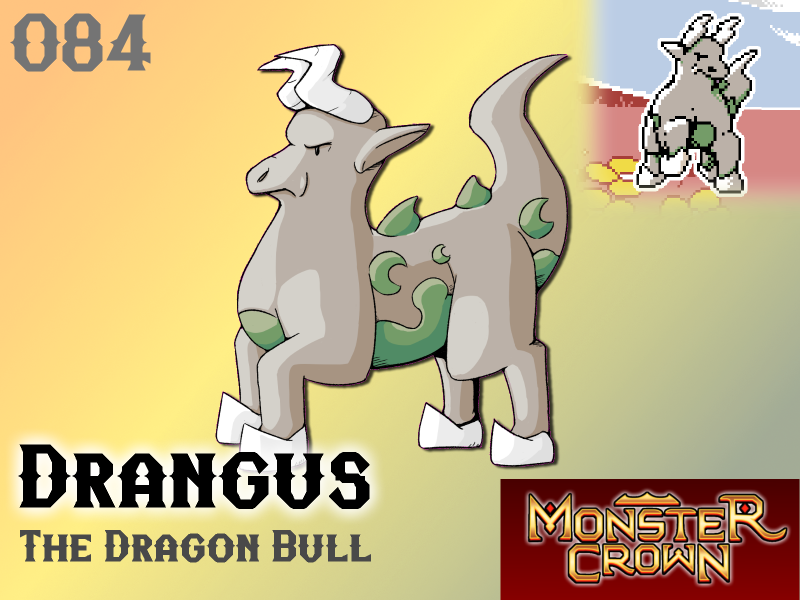 After years of observing man's inability to control dragons he decided to develop a more suitable breed for man to wrangle - the product of this pursuit being Drangus, the bull with dragon's blood. While it's impossible to tell if there's any truth in this old tale, the mythical Shepherd seems to have done a poor job in crafting this beast. Freely roaming the Desperado Province Drangus is unruly, terribly strong and seemingly tireless. Its thick hide demands swords for cutting and they have taken countless lives over the years whenever their short fuses are tempted. Will Drangus make your team? Whether he'll make my Team... i'll give that a 'maybe'. Also, don't send Swords to do an Axe's job.